Life feels very different this side of Easter. The thaw of winter feels complete. As I noticed last year the Spring has brought peace and the ability to tune back into my Shepherds care of me. I’m starting to believe in his love again. I’m starting to enjoy being defined by him and not what I do or how many friends I have. Spring is here in so many ways. The below is just some of that noticing. Home with a chicken pox boy. Doped up on piriton and woozy from nights of restless sleep. We wave off the other half of our team on their way to a wedding in London. With a tinge of regret and a tinge of relief at not having to wrestle two kids at a wedding, we drive home. We bumble around the house. I sort and tidy and my shadow follows me, happy as long as he can see me. We go and feed our friend’s cats and then drive until he falls asleep. At home he sleeps in his buggy and I breathe in and out in a quiet house. Tea and toast and tv. He wakes and then curls up in my lap eyes closing over again. I watch a film. I have my smallest on my lap breathing loud and warm. I write and watch and smile at the rain pouring outside. I shift and find more comfortable ways to sit. He stirs and wakes and smiles in my face. We eat lunch and play Lego and his hands find my face when distracted to pull me back into his world. He cuddles me close and covers me in slobbery kisses. We wander around shops in the afternoon and eventually head out to pick the others up from the station. I smile as the rain turns to radiant sun. A day that would have undone me a few years ago has been enjoyed and embraced. I have felt my Shepherds care. I have loved the stillness of not rushing to fill all the time with people and things and events. Blue sky and brilliant sunshine have cleared away my beginning of the week grumps. It is April. The cherry blossom adorns trees wherever I look. The sun warms me deep and my mind refuses to embrace the darkness. I feel light. I feel alive. I look to a relatively empty week and I am not scared. The dark of winter has been banished. I don’t feel the ache of needing to fill each moment with people to escape the bleakness within. I am more at ease with me. 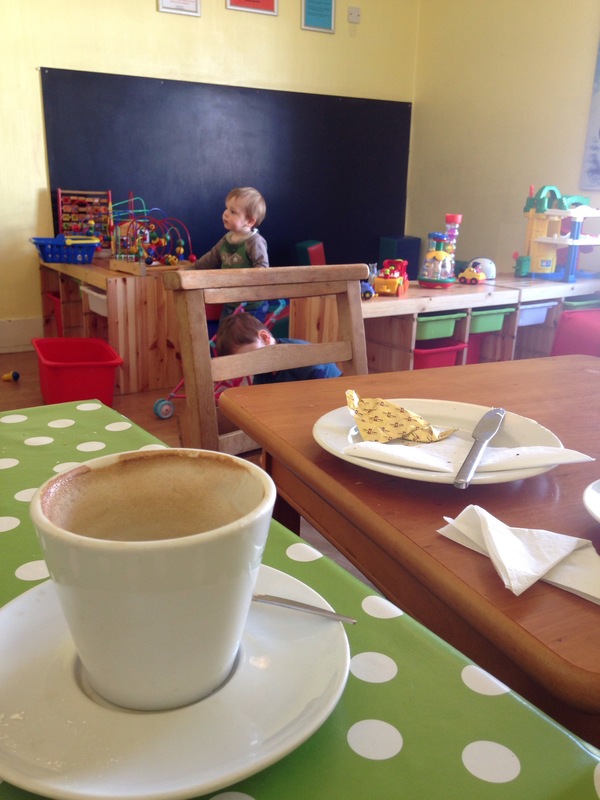 We are sitting in a cafe in Hove, the upstairs turned into a playroom with tables and a stair-gate on the only exit. The boys play with toys and munch croissants. I sit and write and drink coffee. The fear of being on my own has gone. I feel free. The need to prove myself has melted away. I feel free. It is Spring in so many ways. I feel free. 5 Responses to Waking up..
Love your musings, the gentle acceptance and peace. And btw – Hove – I’ll be there later in June at Word Alive, the Christian bookshop. Maybe I could meet you in person? Kath, this is so lovely and peaceful. It was a nice read for my Monday morning amidst all the stuff I have to do this week. Thanks for sharing your days! Beautifully written post, thank you. We posted something on seeing glimpses of the gospel in spring too (http://www.gospelcentredparenting.com/gospel-in-the-everyday-spring/), but we love the way you’ve written this. Thanks for sharing!